This yogi did our 2018 21-Day Challenge and it changed her life both on and off the mat. Here’s how—and why you should sign up for this year’s! Teacher Schuyler Grant in the 2019 21-Day Yoga Challenge, presented by Swisse. 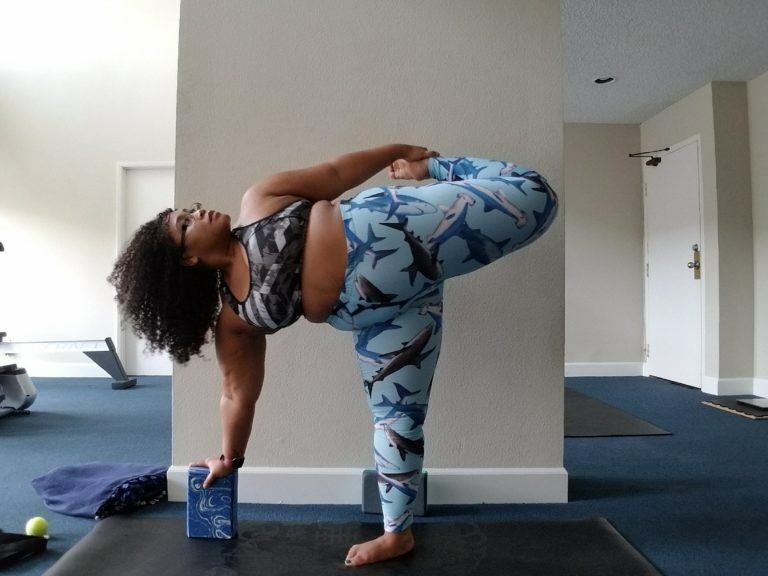 Donesia Dudley is a self-described self love advocate and “wellness chaser” who became a star of the Virtual Yoga Studio during our 2018 21-Day Yoga Challenge. The Challenge inspired her to do her 200-hour teacher training, and she now teaches in Inglewood, California, and is an advocate for accessibility and inclusivity. What follows is her journey. Let hers inspire you to take your own with us this year! When I heard about the 2018 Wanderlust 21-Day Yoga Challenge, I was going through a difficult time. I had just moved back to Los Angeles from New York and was unemployed, living on my brother’s couch. I figured the Challenge was a way to focus my energies on something other than my resume and job hunting. It was that, and so much more. There are plenty of reasons people are scared to commit to 21 straight days of yoga—and the idea of practicing at home is definitely one of them. While I had a steady studio practice prior to the Challenge, I never really had a consistent home practice. Maybe it was unemployment, maybe it was the teacher, Schuyler Grant, or maybe it was the great community I found… Either way, these three weeks changed my life. Here’s how. During the first week, I felt a surge of energy—kind of like the first-day-of-school feeling, excitement mixed with not knowing what I was really getting myself into. The first classes were very foundational, and made us hone in and find our own alignment in our bodies. Everything Schuyler said, I followed. I had no fear of poses—those I was familiar with or those I wasn’t. I was determined to complete this Challenge. My willpower to take this seriously outweighed any and all fear I had about trying new things or practicing sequences that were not familiar to me. Doing the inner work inspired me to begin doing the outer work as well; though I’m already a healthy eater, I began thinking even more about nutrition and what my body needs. Still—and let’s be real—I was pretty darn sore at the end of that first week! The author during Week 1 of the 21-Day Yoga Challenge. Photo courtesy of Donesia Dudley. During week two, Schuyler introduced inversions other than Downward-Facing Dog into the practice. Before the 21-Day Yoga Challenge, I had never willingly flipped myself upside down. I was completely nervous about walking my feet up the wall and staying in the “L” shape. 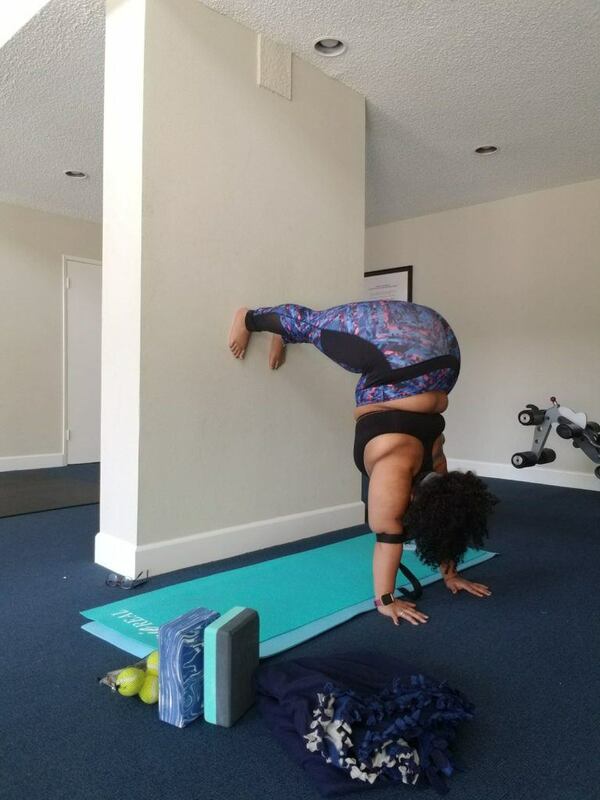 Being a plus-sized girl, I hadn’t seen many women my size in headstands or handstands, except for the venerable Jessamyn Stanley. I knew it was possible, I just didn’t think I could do it. There was a huge amount of fear rushing through my body and mind as I slowly and gradually walked my feet up the wall. I steadily felt my weight being transferred into my arms and down to my hands. As I held this ‘L’ shape pose, I was overcome with a wave of gratitude and self accomplishment. I was upside down for the first time in 20 years. At this moment in the Challenge, I was juggling back-to-back job interviews, workshops, and basic responsibilities. Through my accomplishments on the mat, I was unknowingly breaking down stereotypes that I had about my own self—a skill that was showing up in other areas of my life as well. The Virtual Yoga Studio played a huge role in helping me stay motivated. I am proud to say I’ve made lifelong friendships with people I’ve met through the group. The author during Week 2 of the 21-Day Yoga Challenge. Photo courtesy of Donesia Dudley. Week three brought up a ton of hidden emotions for me. I wasn’t ready for this Challenge to be over. This was more than just 21 days of yoga poses for me. This Challenge was my sanctuary for three weeks, and I wasn’t mentally prepared to let that go. Physically, my body began to get a lot stronger; there were noticeable changes in the definition of my arms, and around my core. I was able to hold a Plank Pose for longer than I had before, and I was now a proud inversion practitioner. Emotionally, I noticed a huge change in my stress threshold. I became better at the interview process because I wasn’t as nervous, and I was able to remain calm, cool, and collected during meetings. Because of these improved skills, I was able to land a job shortly after the Challenge ended. Though the third week was bittersweet, deep down inside I knew it was exactly what I needed during this period of my life. I was filled with so much gratitude for this outlet when times got sticky. The author during Week 3 of the 21-Day Yoga Challenge. Photo courtesy of Donesia Dudley. A 21-Day Yoga Challenge not only provided me with Instagram-worthy pictures to share, but it brought me peace during a very hectic and chaotic time. I learned that even when everything else in your life may be in the toilet, you can still come to your mat. You can carve out 20 minutes of your day to get quiet, be present, and flow. Yoga isn’t just for the body. I was so transformed by the 21-Day Yoga Challenge that I decided to become a yoga teacher as well, and share what yoga has done in my life and what yoga could potentially do in yours. I finished my 200-HR yoga teacher training in July 2018, and I have been sharing my love for the practice ever since. See what a 21-Day Challenge can do for you next month! Presented by Swisse, this year’s Challenge focuses on the body-to-breath connection, and how honing in on it can not only improve your practice, but your daily life. Joining is free. Plus, you can take advantage of a special offer on Swisse multivitamins, which help keep your energy levels up and provide support when you are stressed—so you can achieve your 21-Day Challenge goals. Catch you on the mat!